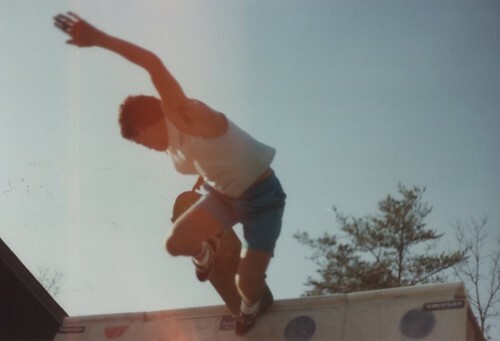 The Sports Archives – Too Old to Skateboard? There are plenty of incredible older skaters out there and seeing them at the park or hearing about how Tony Hawk can still bust big vert tricks at the age of 43, just might be enough to send you running for the skate shop. Heed my advice on this though; when you wipe (you will!) it hurts like hell. I tried to return to skateboarding a few years ago, at 35. My understanding girlfriend was supportive of the idea, and probably bored of hearing about how much I missed it. In fact she provided the catalyst by getting me a lovely board for my birthday that year. That very same day, I hit the local skatepark, a well-known spot in Stockwell, South London. I went after dark, in disguise (ok the disguise is an exaggeration) so I could have some peace and quiet to see what I remembered without embarrassing myself too much. To cut a long story short, I was soon happily rolling about, managing some nice smooth turns on the ramps, staying on my board over the bumps & ripples, and having the best birthday treat in years. After an hour or two of good gentle fun, I got my confidence back, pushing it slightly too hard… then CRUNCH. Yup, it’s true, kids are bouncy. But brittle, bony 35-year old me made one slip-up, reacted badly, and landed heavily on my jaw. I lost teeth, had concussion, a dislocation, got stitches in my chin and spent most of a week in bed, suffering. It felt like they make concrete harder these days, and sad to say, that board has stayed in the cupboard at home since that fall! Local Resources – The Sea! I don’t live in Stockwell anymore, having moved to the seaside a few years back. Last summer I was out walking by the beach with the kids, and lo and behold, hallelujah! There was some perfect surf, just east of Brighton Marina. I guess the surfer network gets word out quick when the waves are right, but every few minutes more surfers were arriving, wetsuits on and boards under their arms. 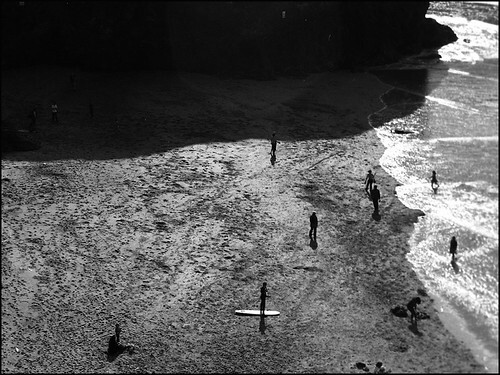 Watching these people, all shapes, ages & sizes, out there riding some great waves just a mile or so from my home, got me wondering if I could get some exercise – and some board kicks – minus the concrete. Hell, the first surfers were skateboarders on wheels, so why not reverse the trend? Getting set up for surfing wasn’t as expensive as I feared, and the sport really is fun. 1 year later surfing gets me in the sea I’d just looked at before. Paddling out, treading water, and trying some tricks is an effective but gentle workout for the whole body. The spills & wipes can be a shock, but seriously – compared to landing hard on concrete, these old bones don’t mind a bit. With skateboarding, the gear was a major part of the obsession. We were always looking for the best trucks we could afford, admiring the new board designs and then tweaking our darlings with a spanner. Happily, I’ve found surfing meets those needs too, and I’m proud of my kit. I was pleased to notice last weekend there is an overhead wakeboarding tow-line set up, with ramps, at nearby Hove Lagoon. This will be my next water sport challenge, so I’ve already got my eye on some funky o’brien wakeboards! Really… heed my words, fellow 30-somethings. Unless you already have skills like Bam Margera, or can afford a lot of time off work with broken bones – surf don’t skate, it hurts a lot less. This entry was posted in Other and tagged Bam Margera, Extreme Sports, Skateboarding, Skateboards, Tony Hawk, Wakeboarding. Bookmark the permalink. 3 Responses to The Sports Archives – Too Old to Skateboard?